Please check our web cam between 6 am – 8 pm for weather conditions. 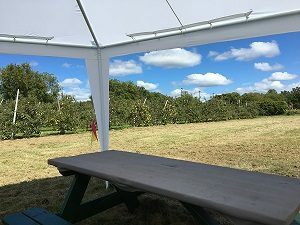 Although we are known for the fruits we produce, there is so much more to do in the area besides picking apples. Come spend the day and hike our two nature trails (approximately 3 km round trip). Pack a lunch and enjoy it at our picnic tables in the great outdoors. We invite you to explore our farm and let nature melt away the hustle and bustle of the city as you take in the scenery. 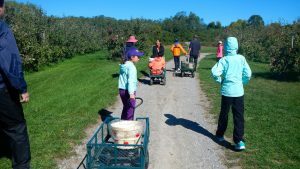 We offer wagon rides (on weekends only in September and October) for a small fee. During mid-August to early October, you can witness the inspiring strength and persistence of salmon swimming up the Ganaraska River to spawn. Find out more about the seasonal migration of salmon and trout up the “The Ganny”. The Ganaraska River Watch brochure is available in English and Mandarin. Bring your beach towels and head over to Cobourg Beach, or trade your laptop for a fishing rod. Northumberland County has many species of fish with different seasons and regulations. Get more information on Ontario’s fishing licenses. Don’t forget to check out our country store!